Diminutive of Middle English perwinke, from Old English perfince, perwince (compare Middle High German berwinke), from Latin (vinca) pervinca (compare French pervenche, Italian pervinca), of unknown origin. 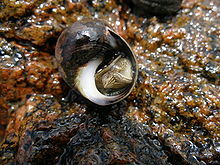 The Periwinkle is a great binder, staying bleeding both at mouth and nose if some of the leaves be chewed. A color with bluish and purplish hues, somewhat light. For quotations of use of this term, see Citations:periwinkle. Of pale bluish purple colour. From Middle English [Term? ], alteration of *pinewinkle (compare English dialectal pennywinkle), from Old English pīnewincle, compound of Latin pīna (“kind of mussel”), itself from Ancient Greek πίνη (pínē), variant of πίννα (pínna, “mussel”)) and Old English wincel (“corner”) (compare dialectal Danish vinkel (“snail shell”)). More at winch and wink. A mollusk of genus Littorina.